Contemporary electric motorcycles have been around for over a decade, existing primarily on the fringe of the hobby. Manufacturers like Brammo, Zero Motorcycles and Alta Motors have all enjoyed some degree of success, but the high cost and restricted range of electric bikes – at least compared to internal combustion equivalents – has limited their appeal. 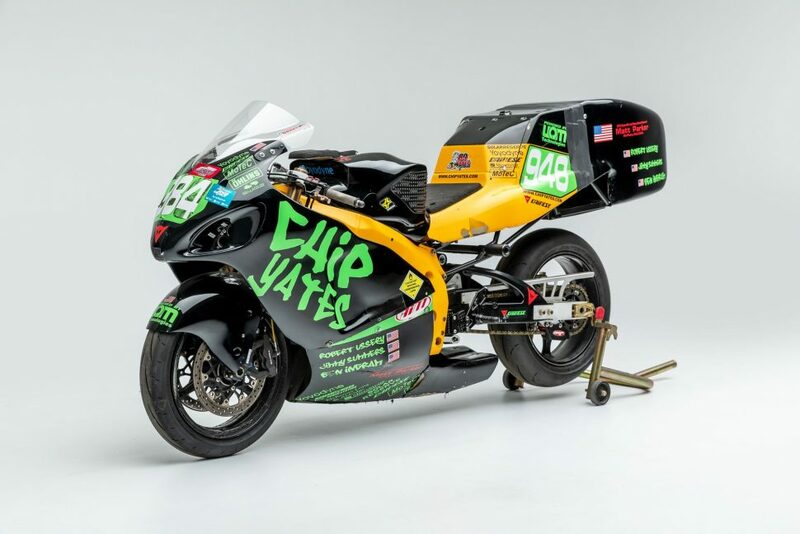 Chip Yates’s electric superbike prototype. Brammo was sold to powersports giant Polaris in 2015, but the decision to kill off its Victory brand signaled the end of Polaris’s e-bike experiment, and Brammo’s remaining assets were sold to Cummins in 2017. Alta Motors was acquired (in part) by Harley-Davidson in 2018, and the Milwaukee manufacturer is aggressively pursuing a new generation of rider with its upcoming LiveWire electric motorcycle. That leaves Zero Motorcycles – which offers battery-powered on- and off-road motorcycles – as the current market leader. The Mission One, from the now-defunct Mission Motorcycles. Other companies, such as Mission Motorcycles, ran out of capital before they ran out of ambition. Its Mission One electric motorcycle, launched in 2009, claimed a 150 mile per hour top speed and a 150-mile range, though at a price of nearly $69,000. 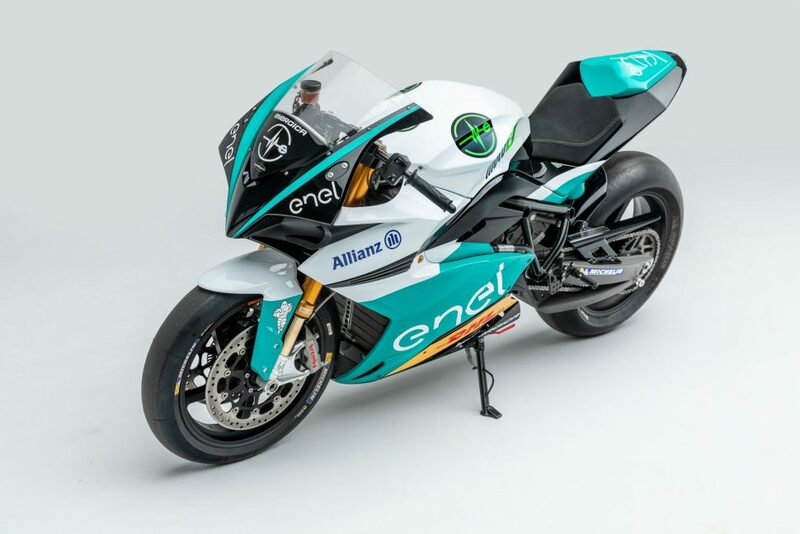 The company enjoyed racing success, too, setting an electric motorcycle land speed record in 2009, beating rival MotoCyzsz at Laguna Seca in 2011 (and setting an electric vehicle lap record in the process) and even setting a lap record on the most unforgiving track of all, the Isle of Man, in 2014. By the end of 2015, however, Mission Motorcycles had ceased operations. Cake’s Kalk off-roader sold out its first production run of 50 units. 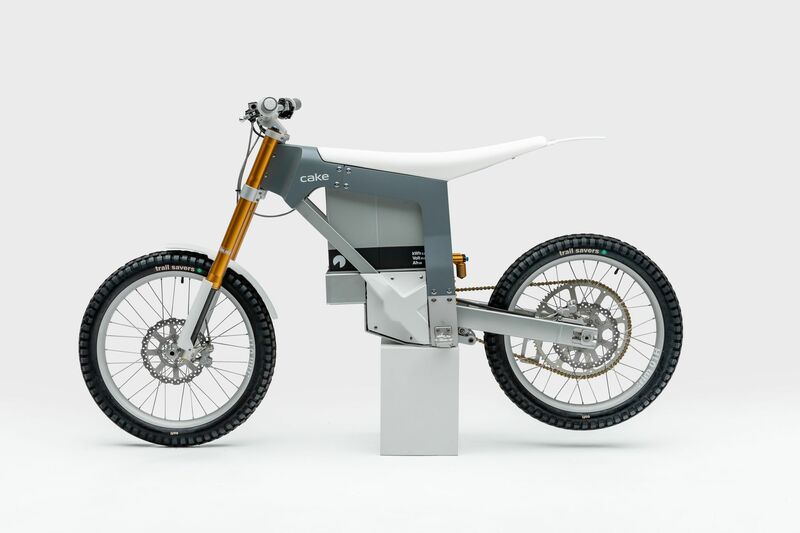 Like Zero Motorcycles, other firms have demonstrated that a market exists for electric bikes, including Swedish manufacturer Cake, which earned design awards for its “Kalk” off-roader. More significantly, the Kalk sold out its first production run of 50 units, perhaps due in part to its more-attainable $14,000 price tag and sub-155-pound weight. With a range of roughly 50 miles and a top speed of just over 43 mph, it’s suitable for a wide range of off-road (and on-track) activities, and the company’s product line will expand in 2019 to include a dual-purpose on- and off-road motorcycle. Harley-Davidson’s LiveWire in pre-production form. Photo courtesy Harley-Davidson. 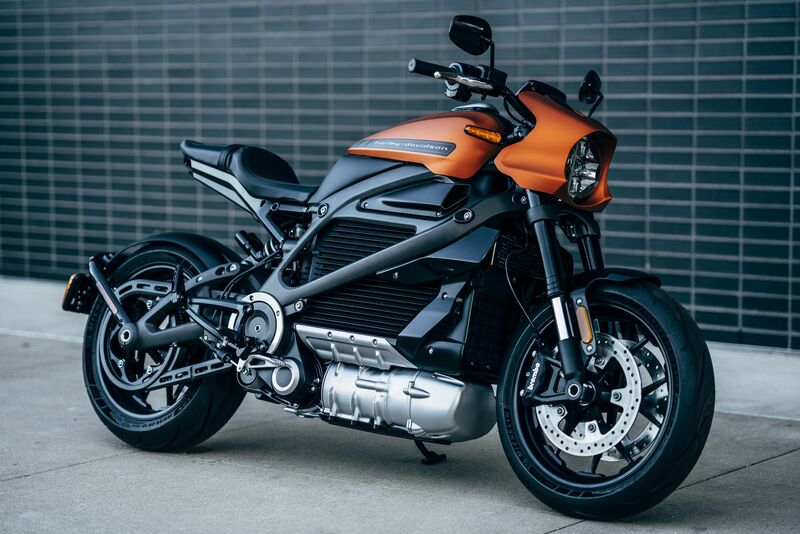 Harley-Davidson may well be banking its future on the success of the LiveWire electric, which promises 0-60 mph acceleration in under three seconds and a maximum range (under ideal conditions) of 140 miles in the city and 88 miles on the open road. If there’s a drawback, it’s the announced price of roughly $30,000, or nearly double that of Zero Motorcycle’s top-shelf offering. The Curtiss Motorcycle Company’s Zeuss concept. It will be produced in Bobber and Cafe styles. Another established manufacturer, Curtiss Motorcycles (formerly Confederate Motorcycles) is also staking its fortunes on battery-powered bikes. While the gasoline-powered Warhawk is a current offering, the brand is counting on the success of its Zeus and Hera electrics, with the Zeus launching in Bobber and Café models later this year and the Hera announced as a 2020 model. As with earlier Confederate offerings, each is hand-built and most unconventional – as is the starting price of $60,000. Moto Undone, a custom electric bike from Joey Ruiter. As with internal-combustion motorcycles, there will be customizers who think outside – and in some cases, far outside – the box of conventionality. 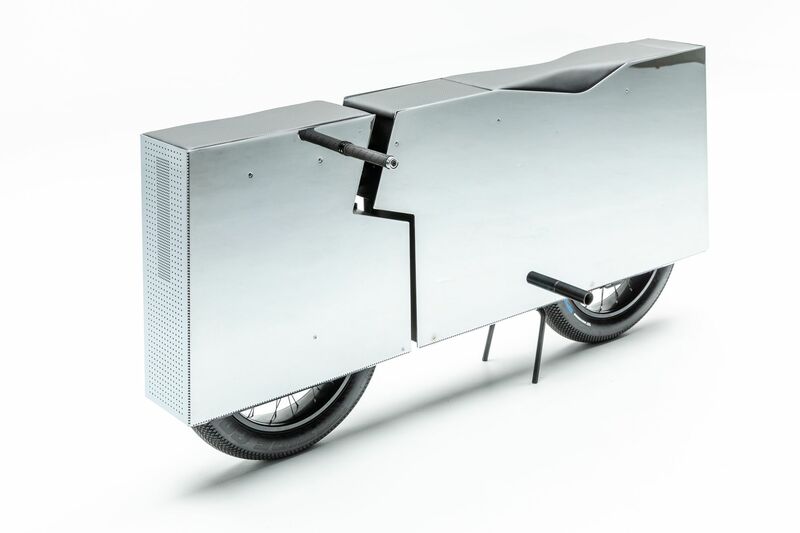 “Moto Undone,” a concept electric bike from builder Joey Ruiter, is quite literally a box on wheels, equipped with a saddle, footpegs, handlebars, and little else. 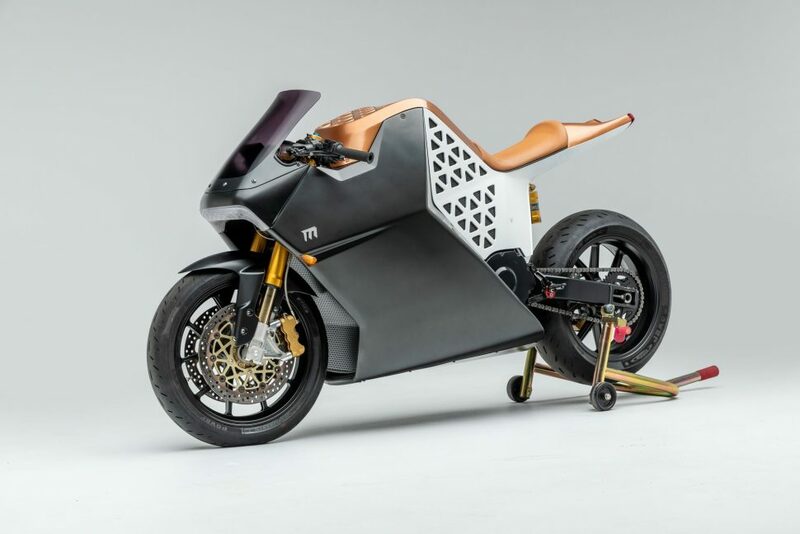 A design statement, it also makes the point that electric bikes have fewer restrictions than gasoline-powered ones, and that the future of motorcycle design is anyone’s guess. As the transportation industry moves toward electric-powered vehicles, it is our responsibility as a museum to accurately represent this progression with our exhibits. Because of the growing popularity of e-bikes, we felt it was the right time to debut “Electric Revolution” and show how these ultra-stylish and contemporary designs are pointing the way to the future. 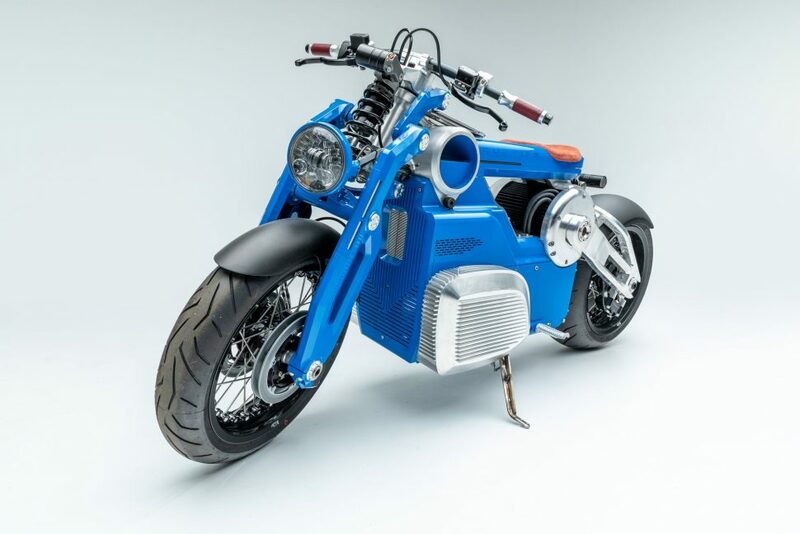 As with Custom Revolution, the previous exhibit, Electric Revolution is curated by Motorcycle Arts Foundation co-founder Paul d’Orleans, and will appear in the Richard Varner Family Gallery until November 2019. For additional details, visit Petersen.org.